Clear PVC bag with two 2.8 oz. bottles with squeeze tops, one 2.8 oz. bottle with spray top, two 1.3 oz. jars and funnel. 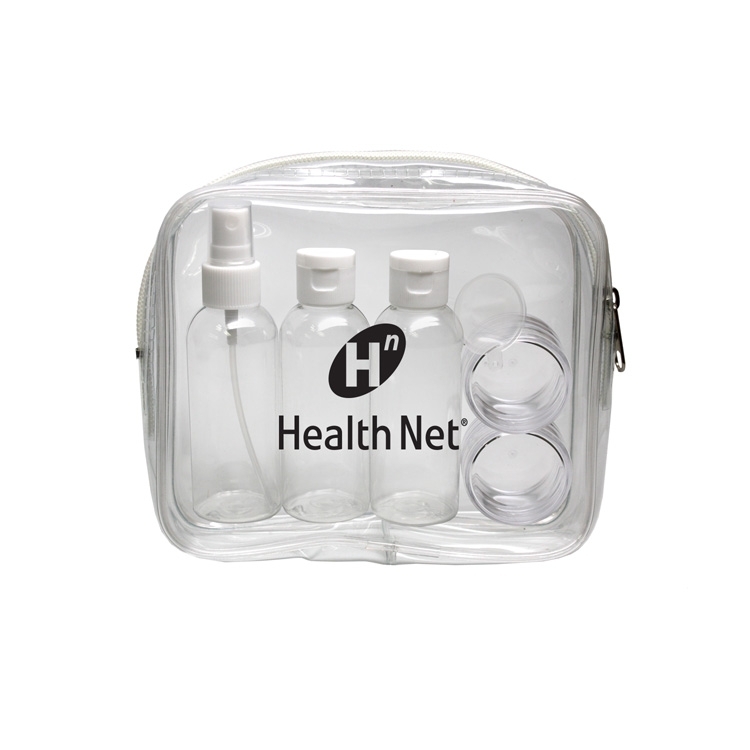 Bag: W 2-1/2" x H 1-1/2"
Bottles: W 7/8" x H 1-1/2"
Jars: W 7/8" x H 5/8"
Bag: W 6 1/2" x H 4 3/4" x D 1 1/2"
Shipping Wt. 50 units= 10 lbs. Note: Price includes 1 color/ 1 location on bag only. Additional $0.50 (g) run charges apply to bottles an jars per color/per location. Separate setup charges apply to bags and bottles/jars. Shipping Weight: 50 Units: 10 lbs. Setup Charges: $60 (g) Additional $0.50(g) run charges apply to bottles and jars per color/per location. Separate setup charges apply to bags and bottles/jars.